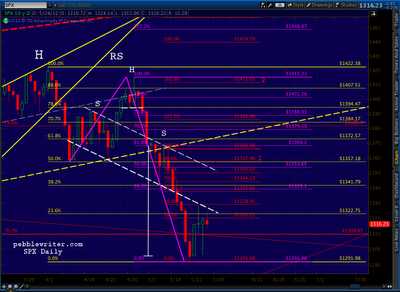 I've taken advantage of a relatively quiet morning in the markets to finish mapping the road ahead. There are quite a few harmonic patterns in play right now. My practice is to map all the apparent possibilities and look for confirmation (or lack thereof) between patterns -- and then look for ways in which they agree or not with all the chart patterns, channels and analogs I'm watching. It's fairly exhaustive, so takes a fair amount of time. I hope to post the results in the next hour or two. In the meantime, the short-term forecast is still for increasing prices. This morning's chop does nothing to change that, but does illustrate the importance of using stops. Like yesterday, l will occasionally post short-term trading opportunities. For traders so inclined, the idea of shorting at 1328 and buying back at 1298 is a great trade. But, it requires a fair amount of vigilance. For the buy and hold crowd who aren't interested in 30 point blips, feel free to ignore such forecasts. Whichever camp you fall into, please remember to use stops at all times. These are very precarious times, where unforeseeable events capable of moving markets are unfolding daily. Please don't get caught with a significant portion of your net worth hinging on any particular forecast -- mine or anyone else's -- without protection. For those of you who who haven't joined pebblewriter.com yet, prices are going up at midnight tonight (PST.) Current members are not affected, of course. And, as before, the first 100 annual members are grandfathered for the life of the site. If you're a quarterly or semi-annual member, you might want to consider upgrading to annual. To sign up, click here. The 5-min RSI just broke out from a falling wedge on positive divergence. If it can stay above the upper bound this morning’s decline should be erased, and then some. 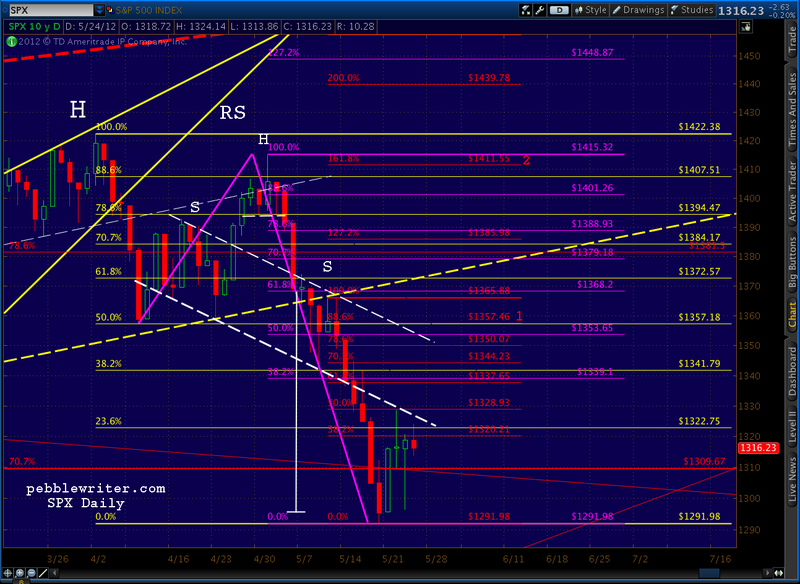 Watch for a back test of the wedge, which would correspond with a back test of the little red trend line at around 1311. Still working on the longer term picture. I’ll send a message as soon as it’s posted. At this point, all members should be receiving an email within minutes of when a significant post or update is posted. Please let me know if you’re not receiving these messages. I’ve put the texting option back in the sidebar to the right. Just enter your cell phone and service provider and you’ll be notified of new posts. Note: it doesn’t notify you of post updates, just the initial publishing of a new post. That worked out pretty well. The falling wedge paid off as advertised, turning an 8-pt decline into a 2-pt gain at 1310.50 — just a smidge below our 1311 target. I hope readers were able to take advantage of it. Since I didn’t complete the longer-term picture before the close, I’ll work late this evening and try to get it up before turning in. BTW, I get a number of emails during the day from readers, and I’m good with that. But, I much prefer that anything market related — questions about strategy, investment options, etc. — go into “comments” on the post. I’m likely to see them more quickly, and more importantly, your fellow readers might benefit from the discussion. Thanks! For those of you who who haven't joined pebblewriter.com yet, prices are going up at midnight tonight (PST.) Current members are not affected, of course. Remember, the first 100 annual members are grandfathered for the life of the site. If you're a quarterly or semi-annual member, you might want to consider upgrading to annual. To sign up, click here.